Baan Sijan Villa is set within the tranquil area of the Angthong hills close to Nathon the capital of Koh Samui. This small town offers all the charm of a traditional Thai way of life. Our luxury villa is surrounded by the beauty of the Gulf of Thailand which lets the cool ocean breeze and the beauty of the mountains ease away your everyday pressures of life. The beach is a short distance away where you can still see the locals fishing with bamboo rods and the buffaloes being prepared for the islands famous bull fights. 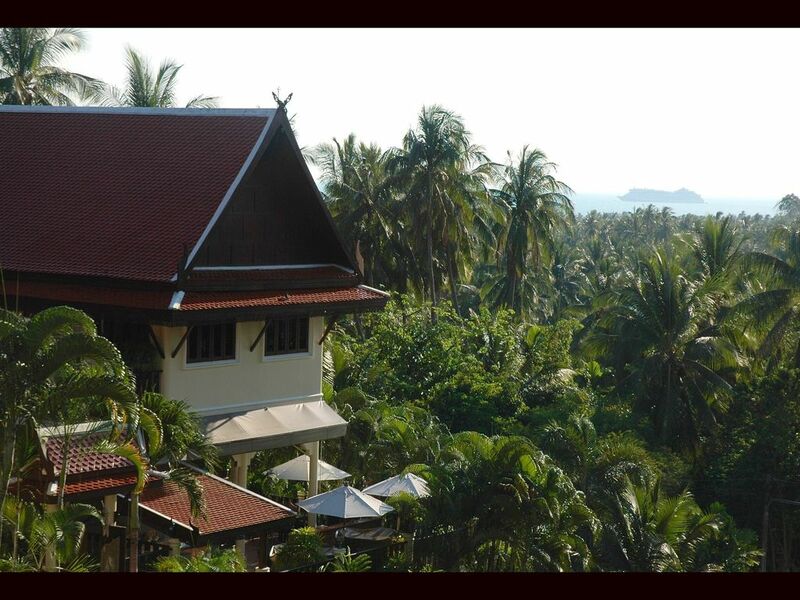 Baan Sijan Villa is built on three levels and offers our guests an enormous choice of opitions, whether it is pure relaxation, sunbathing on our many terraces,or just lounging and admiring the surrounding beauty of the sea and mountains. Or you may prefer working out in our fully equipped gymnasium, or taking a sauna, After all that we can arrange for you and members of your party to finish your day with an in house famous Thai massage. We moved to Thailand in 2002 from the UK. Baan Sijan Villa was created and designed and built by ourselves. We created our dream home and then decided to share our dream with everyone else. The villa is totally unique and extremely special in many ways. We have a large amount of repeat customers who have now become friends. The villa is ideal for large parties or family reunions and offers many special areas within the Villa for enjoying your own space or sharing. Very special unique property which has so much to offer in location and the the amazing architecture and feel. Please see reviews on Trip-advisor to get a idea of what Baan Sijan has to offer. Suite or family bedroom 5 has a very large en-suite wet room with bath, wc, and shower. 4 en-suite wet rooms with shower and wc. Further 2 bathrooms with wc, showers on ground and 3rd floor levels. Wifi throughout the whole villa this is free and included with the rental pricing. Large living room (one) with adjoining dining room catering for large parties. LED TV 55", DVD Home system, CD Player. This room is perfect for relaxing and watching those great movies that you can purchase locally. Large family kitchen with central work island. All modern facilities range cooker, fridge/freezer,dish washer, microwave, toaster, blenders. Many balconys are throughout the villa on all levels. Many terraces throughout the villa. Koh Samui now has 3 wonderful golf courses, they both have amazing views looking over the gulf of Thailand and the sister islands and the fairway's and green's are managed to perfection, a dream for any golfer. The club houses offer excellent food and wine also. Notes on accommodation: On entering the villa through the electrically operated gates you will observe the well tendered gardens which surround the villa on all sides. The villa, grand in size and furnished in contemporary Thai style to a very high standard, which comprises of the following. Ground floor, fully equipped gym/sauna/massage room/table tennis table, with lounge area TV/DVD/CD and bathroom. Third floor which contains the following, office which has all modern communication facilities internet, fax machine, computer if you need to answer any important business issues while you are away. On this floor is a beautiful reading lounge which looks out again onto the surrounding jungle and coconut plantations were you can watch the locals with trained monkeys collecting coconuts to sell locally. Also on this level is a private bathing area which is set overlooking the garden and with amazing views over plantations and towards the gulf and the wonderful islands of the world famous Angthong Marine Park. Outside: A beautiful (salt water)swimming pool which is set part inside the house which is good for people and young children with fair skin who do not wish to be in the full sun too much, and the remaining part of the pool is outside, with an amazing back drop of the mountains behind which graces this outstanding villa, this pool is solely for the use of the people renting the villa. We have all around the villa areas for wining and dining whether individual or together. The Sijan Bar Lounge which is surrounded on all sides with extensive amazing views of surrounding mountains and distant sea views. In this area there is seating in various styles, pool table and a balcony with outside dining and sun loungers which stretches around the front and side of the property. Also on this level is an outside kitchen area with BBQ, cooker hob and double sink for those special day's or evenings. This area also benefits from a large electrically operated blind which covers the outside dining and BBQ area. Utility Room: Outside utility room with washing machine. Cleaning / Towels / Linen / Maid service: The towels and linen will be supplied and changed every third day or when requested. Maid service to clean rooms will be daily. Laundry and ironing service also but a extra charge will be applied. Other: Large open plan lounge (two) with high vaulted ceilings and bar with sun terraces outside kitchen and BBQ with outside dining. Pool table area with various styles of seating throughout. This area benefits views of the mountains and distant sea views. We spent two weeks here in the middle of the Thai jungle :) peaceful and quiet villa with a nice pool and lovely bedrooms and spatious open "living room". All of our wishes were completed by the lovely staff and the owner herself - Jana and Any. A perfect place to recreation and regeneration! Don't care about the evil review from one family from India. We read it and were a little bit stressed about our choice but the day we arrived all our doubts were gone! Very clean, nice and beautiful place. And amazing surroundings. Baan Sijan can offer help in many ways and activities. We offer In-house Thai cooking classes along with local market shopping so that you can get the correct ingredients to enable the true Thai taste and a memorable experience that you can take away with you back home. Massage and sauna treatments, cycle hire, island tours, cocktail & sunset tours, organized shopping trips, fishing trips, island shows, Harley Davidson motorcycle hire. Our aim is for your experience of Thailand to be a memorable one in a life changing good way. Beautiful beaches are all around the island and many of them locally, which are within 5 min if travelling by car. Many of the beaches are what most people describe as the bounty advert beaches, miles of unspoilt stretches of white powdery sand, a dream !! The island is really split into two on the North East coastline the beaches are busier with the larger hotel chains and on the south and around Baan Sijan the beaches remain quiet beautiful and very local. The nearest airport which is the only one on the island is approx 35min away by car. The nearest port is only 5 min away and that is the capital of the island, Nathon, which offers all the charm of a traditional Thai way of life. To benefit and to see and explore the island we recommend that car or motorbike hire is taken and this can be arranged by us at Baan Sijan. Baan Sijan Villa is set within the tranquil area of the Angthong hills close to the capital of Koh Samui Nathon which offers lots of Thai charm and a great place to shop, the distance is very short approx 5min by car. To get to the main tourist and nightlfe areas of Lamai & Cheweng this will take approx 25min depending on time of day, these areas offer every type of nightlife known to man and is very entertaining. Places of interest are found all over the island and start right on our doorstep. Nathon is the center of all the business dealings such as banks and government buildings, it also benefits from a lot of local business which sell items from all over Thailand which are sold at very competitive prices compared with the more built up tourist areas. It also has become the centre for amazing restaurants which line the streets and the beach road coming into the town, they all offer a fantastic range of freshly cooked food from all over Thailand and the world. People travel from all over the island to come a see and sample these amazing delights. In the town we also have all the major super markets and international shops so don't worry if you have forgotten anything. Nathon also hosts some amazing festivals and food fairs which are a must to see and join in with the locals. The town also is the main port for the ferries which go to Don Sak on the main land and other sister islands, also you can see the local fishing boats big and small come in with their daily catch, you can purchase of them directly and BBQ your purchase at Baan Sijan villa. Nathon also has quite a few travel agents and also a tourist office which enables you to see what Samui and the surrounding islands and mainland has to offer and bookings can be made direct at a very reasonable cost. One thing most people miss when they visit this wonderful and beautiful island is the countryside in the centre of the island with the mountains and remote villages were life has not changed for 100's years many tours go up through the centre, but this can be done with care by yourselves. You will find fantastic little restaurants small local shops selling fruit and vegetables, amazing wildlife and birds, a real must, it is like entering another world. Throughout the whole of the island there are many different types of restaurants and bars ranging from first class down to local all have something to offer. 20 min drive is Fisherman’s Village which has many up market restaurants and bars. Booking Notes: Please contact by email or phone before sending money for security checks. Deposit required within 24hrs of confirmation booking. Booking fee 50% of total cost. Balance paid in full 55 days before booking commences. A breakage deposit will also be added or paid on arrival of £500 and refunded at the end of your holiday if no damage is done. Cancellation no refund unless extreme circumstances which can be discussed with ourselves. Deposit 50% is non-refundable in all cases & situations. Changeover Day: We are totally flexible and we will help in everyway to enable you to have a relaxing and wonderful stay, however we request that the villa is vacated by 12pm unless arranged otherwise at time of booking. Notes on prices: Price is for the property per day in UK pounds. Price ranges for the whole villa on maximum occupancy 11 persons from £35 to £38 per person per day. Please contact us directly for availability. During 2015 we have made many changes and improvements to Baan Sijan Villa. We can offer packages which includes car hire and in house chef please ask for details if you would like this service during your stay. See Facebook Baan Sijan Villa Resort & on Trip-advisor for reviews.